Since I was at the airfield this morning and not taking photos during intramurals, I was looking forward to seeing all the activity from today's coverge just as much as you all were. Since I don't have a Basic here, I go to the main BCT 1 gallery to see all the coverage unsorted by squadron. That reminds me that based on some email we received this morning, I think I need to explain about BCT 1 & 2 again, but I will get to that later. First, I have a couple of questions. I wonder if you do too? 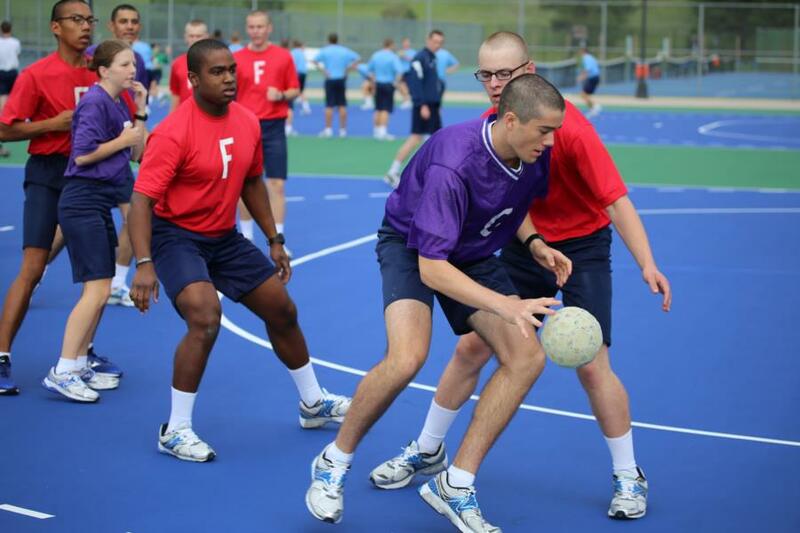 What exactly is Team Handball? I heard it was an official Olympic sport, but where is the wall? Isn't the ball supposed to be smaller. From the photos below it looks like they are playing dodgeball, or basketball with a softball. Is ballet training required to play? I was very confused. Next questions. 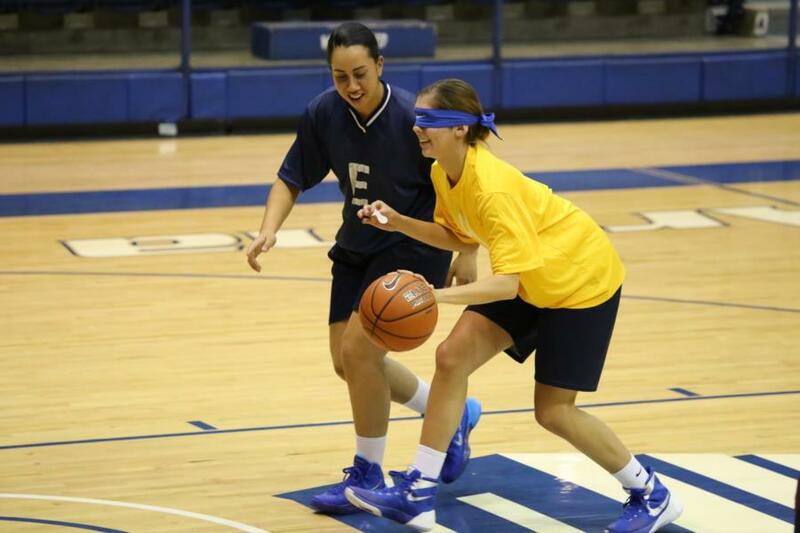 What exactly is blindfolded basketball? Why is the blindfolded player required to carry her mouthpiece while dribbling, and is the fact that the unblindfolded player a Preppie have any significance? Did I just write a run-on sentence? These are important questions. These next photos aren't really questions. They are more of an answer to one. Someone asked in an email where the Guts football players were? 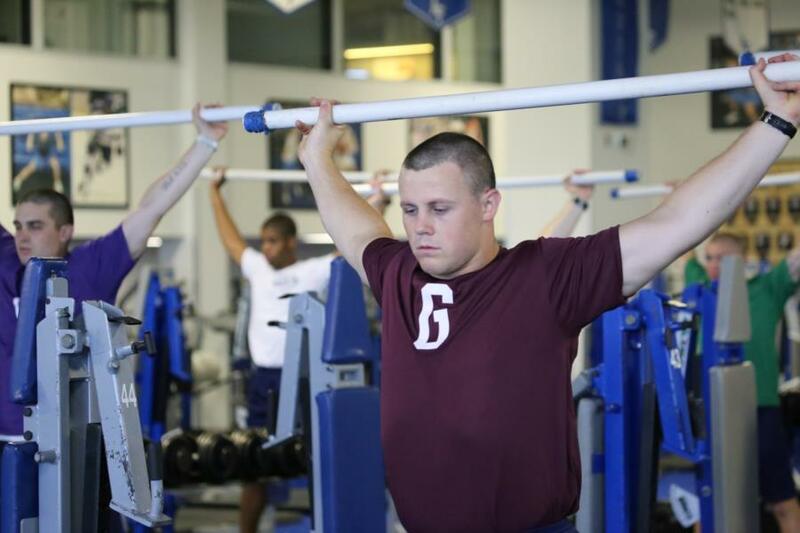 Looks like they were in the weightroom with the rest of the football players. These photos may not have been in the Guts gallery. 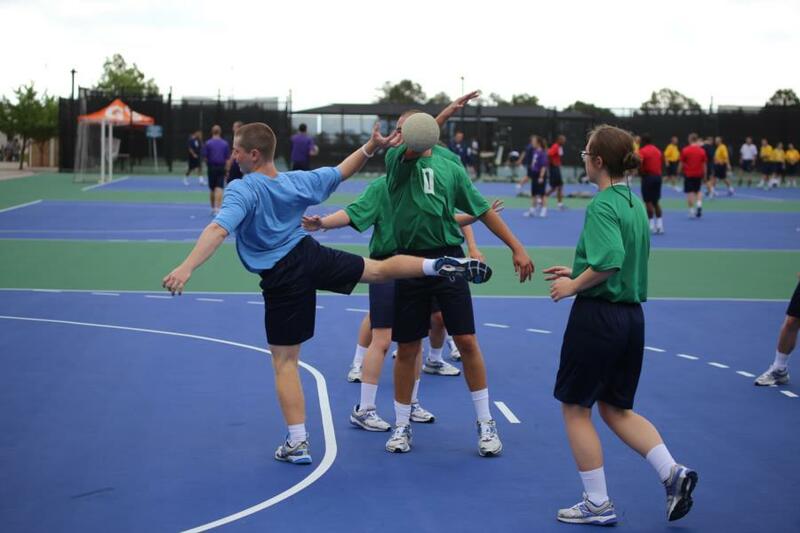 Most of the IC photos couldn't be sorted by squadron, so they are only in the BCT 1 gallery. I'm sure these questions will all be answered in due course. I just wondered if I was the only one who had them. Now, back to the BCT 1 and BCT 2 question. Every year there is some confusion about these terms. BCT 1 is NOT day one of BCT, nor is BCT 2, day two. 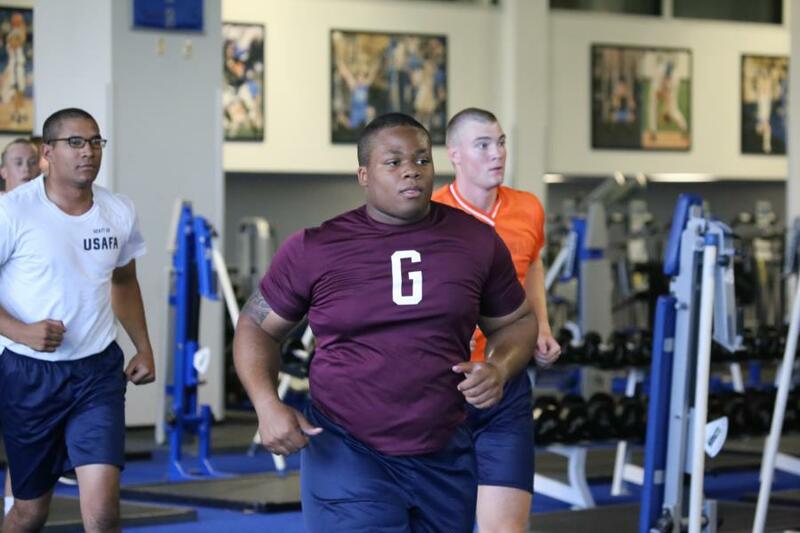 As I may have mentioned in an earlier blog, Basic Cadet Training has two phases. BCT 1 runs from In-Processing Day until Doolie Day Out on July 24th when BCT 2 begins. The 3rd summer period begins on July 25th. The new cadre arrive to take the Basics through the end of BCT. We divide our photos into those two phases as well. That is why on the WebGuy home page, you see two sets of BCT icons for the squadrons. One for BCT 1 or First Beast and the other or BCT 2 or Second Beast. I hope this explanation helps. Ok! That's it for tonight. I am headed back to the airfield tomorrow morning to catch the rest of the the 5th jumps for this group of 2019 Cadets. Our 5 photographers will be back at intramurals again, and Yes, we will look for the Fencers. I know it is getting late on the east coast, but I hope you all enjoy your evening. For my part, I am watching the Angels vs Orioles baseball game and getting a little down time till tomorrow. All the photos from today are up, so happy hunting till tomorrow.